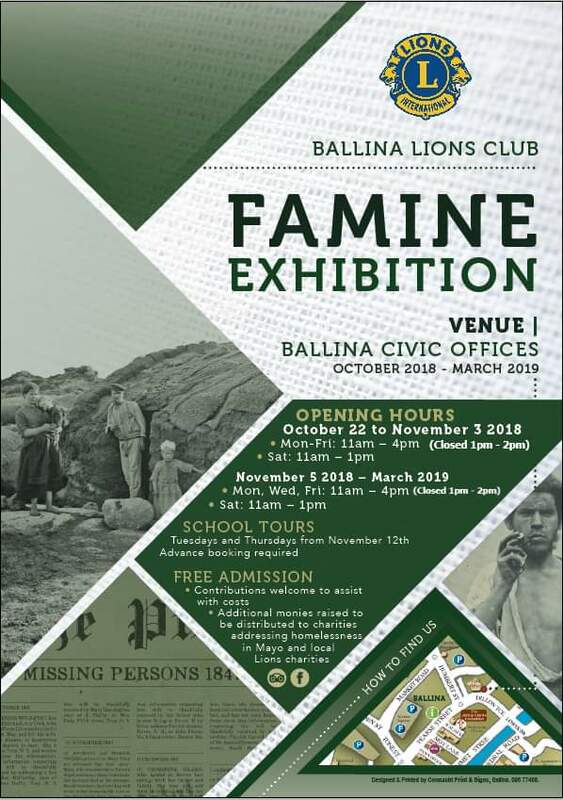 Ballina Lions Club are proud to announce details of their upcoming Famine Exhibition which will be held in the Ballina Civic Offices from October through to March 2019. The Lions Club motto is “We Serve” doing this in many ways from raising much needed cash for local charities to hosting social outings for local people in need (Christmas Day Dinner, Senior Citizens/Careers holidays, Annual Special Needs Party and Simon Day out) to health awareness projects and seminars to name but a few. The club’s latest project in hosting a Famine Exhibition will build how we “serve our community” by providing a deeply moving and educational account of this devastating period in Irish history. The exhibition will be located in the exhibition space within the Council Civic Offices at Dillon Terrace in Ballina allowing people to experience this valuable resource. The exhibition itself consists of a series of sequentially numbered wall panels, a basket containing 14 pounds of potatoes and a 15-minute documentary film which charts the course of the famine. There will be a multitude of famine memorabilia and artefacts on display. The story begins with the state of Ireland on the eve of the Famine, the appalling poverty of the labourer in stark contrast to the extreme wealth of the landed gentry. It then leads us through the arrival of potato blight in Ireland, the inadequacy of British Government Relief Efforts and the devastating impact it had on life and families in Ireland while detailing evictions, the establishment of Soup Kitchens and Workhouses, evictions, emigration and private relief efforts. The exhibition is designed to be highly visual, light on text and easy to understand. It takes approximately one hour to absorb the experience. We see this exhibition as being very beneficial to local people interested in our history, visiting tourists and students in the Connaught region and beyond. We have engaged with local volunteer, business, educational and tourism groups to ensure that as many people as possible can experience and benefit from it. Cost: There will be no admission charge for this exhibition. We would ask patrons that they consider making a contribution toward the cost of bringing this exhibition to Ballina. Any additional monies raised will be distributed amongst charities addressing the homelessness crisis in the Mayo region and other local Lions charities.